There are many different conspiracies that have come up due to the assassination of President Lincoln. What people believe to be the Simple Conspiracy theory is the idea that the original plan, before the assassination, was to kidnap the president. They deliberately waited for him to show up at the place that they expected him to go to, but he never showed up. This caused them to have to change their plan to assassination. Booth and his group of co-conspirators in this plot not only planned to kill Lincoln, but they also planned to assassinate the Vice-President and the Secretary of State at the same time. By doing this, they hoped to help the South rise again because the government would be in a panic. In contrast to the Simple Conspiracy theory, the Grand Conspiracy Theory says that Booth had contact with Confederate leaders and that they were working together to plot against Lincoln. There were coded letters that were found in Booth's trunk that were used to connect him to the Confederates. Also, as the situation got worse for the Confederates, they knew that they needed to come up with a better plan. The president was viewed by them as a wartime target. This theory was first thought of by Otto Eisenschiml who wrote a book about it. There are many different parts that all go together to make up his conspiracy theory. He believes that Secretary of War Edwin Stanton was a prominent figure in the plan because he is one of the only two people that General Grant would take orders from. Since Grant did not go to the theater with Lincoln the night that he was killed, Eisenschiml claims that he must have been the one to tell Grant not to go with Lincoln because he knew what was going to happen. He also talks about why Stanton did certain actions after the assassination. He supposedly left an escape route open for Booth to use so he could get away after he shot Lincoln and he did not release information about Booth right away because he wanted him to get away cleanly.There were also pages that were missing from Booth's diary that were found many years later hiding in Stanton's attic and Eisenschiml takes these to mean that Stanton was a part of the plot because he took the pages and hid them so that when Booth got caught the pages would not be read by anyone else. In reality, all of these claims can be disproved because there is a reason behind all of his actions. In this blog, even though it is not a completely reliable source, the author Alex McMullen does a good job of doing just that. He starts by talking about Eisenschiml and his life. He goes into reasons as to why Eisenschiml would want to write this book and then he takes the claims that were made in the book and gives reasons as to why the claims are false. The main things that have been mentioned surrounding this conspiracy theory include the ideas that there were priests in Minnesota who had been talking about the death of Lincoln four hours before he had even been shot, that the Pope favored the South, and that Lincoln was shot on Good Friday, which is the day that Jesus was crucified. For whatever reason, the priests knew that Lincoln was going to be shot, so they must have been involved even though they are in Minnesota. According to this theory, because the Pope favored the South he automatically wanted to assassinate the president. For the third idea, it just happened to work out that Lincoln was going to the theater on Good Friday. Why would the Catholic church want to kill a man on Good Friday? Why would they even want to kill a man? There were apparently papers in Booth's possession that had the secret cipher that Jefferson Davis used with his secret agents. This claim is showing that Davis had hired Booth. One of the most important parts of this conspiracy is that when Davis found out that Lincoln had been shot he was quoted in saying that it would have been better if he had died. He also said that the job would have been complete if Edwin Stanton and Andrew Johnson had been killed along with him. This source below includes the exact words that Jefferson Davis was quoted as saying. These conspiracy theories do not have any meaning to most historians because the assassination was simply an opportunity to kill Lincoln due to the fall of the Confederacy. After Booth's initial attempt to kidnap the president fell through, he had to come up with some other plan to save the Confederacy. Once he found out that Lincoln was planning to go to Ford's Theater, he knew what he would do. He planned to assassinate Lincoln, Vice President Andrew Johnson, and Secretary of State William H. Seward. He wanted to do this to try to cause the government into a disorder. Lincoln was going to go the the theater on April 14, 1865 to watch a play called "Our American Cousin". He was in a private box with his wife Mary, an officer named Henry Rathbone, and Rathbone's soon to be wife Clara Harris. 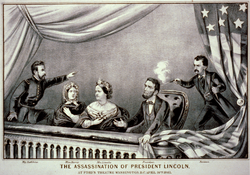 Lincoln was assassinated at Ford's Theater by John Wilkes Booth when he snuck into the private box that Lincoln occupied and shot him in the back of the head. He then stabbed Rathbone, who had ruched at Booth, and jumped onto the stage. Booth yelled "Sic Semper Tyrannis" and was then able to escape the theater and leave on horseback. Lincoln was carried across the street to a house where he was laid onto a bed. When the surgeon arrived, he told them that Lincoln would probably not last through the night. While all of this was going on, Booths accomplice, Lewis Paine, entered the Secretary of State's mansion saying that he was delivering medicine because the Secretary of State was sick. Paine slashed his throat twice and then was able to escape. However, The Secretary was saved and he even lived for another seven years. John Wilkes Booth: He was an actor and he was part of a 12-day manhunt after he shot Lincoln. David Herold: He was a pharmacy clerk who led Booth on his escape route. George Azterodt: He was a carriage painter and boatman and he had secretly brought Confederate spies across the Maryland waters. He was assigned by Booth to kill Andrew Johnson, but he never followed through. Lewis Powell: He was a prisoner of war and he was originally part of the plan to help with the kidnapping and then later he was told to kill the Secretary of State. Mary Surratt: The conspirators met in her boarding house to discuss their plans. Michael O'Loughlin: He was Booth's childhood friend and and ex-Confederate soldier. Samuel Arnold: He was a friend of Booth's and he was connected to the kidnapping plot. Samuel Mudd: He was a doctor who fixed Booth's leg after he had escaped from the theater. Edmund Spangler: He worked at Ford's Theater and he helped Booth. John Surratt: He was a confederate spy who was very valuable to Booth because he introduced him to Herold and Azterodt. He was a part of the kidnapping plot and fled the United States when he heard of the assassination.